So, with the daunting little packets defrosting in the fridge, I dove into the interwebs for inspiration. I did first checked a New Zealand cookbook that I have, but sadly there were no recipes for this specific cut. My inspiration for this dish started with this recipe for Slow Cooker Massaman Lamb Shanks, which sounds awesome, but I was missing the key curry paste ingredient. I considered subbing in yellow curry paste, so I looked up details on the various pastes and found that the Massaman Curry is influenced by Indian flavors and was a bit different to all the rest – bottom line is that I just didn’t want risk it and mess this meal up. I then found a list of links to Indian-inspired recipes, and the author advised that you could substitute other meats or chickpeas in any of the recipes. 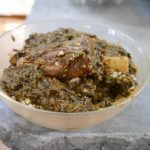 That’s when I decided to combine this Saag Paneer recipe from the Slender Kitchen blog with the Lamb Shank specific instructions in the Massaman recipe, and I have decided to share the result today because I think it is worth repeating – our 15 month old little man even approved! Saag just happens to be my favorite dish to order when eating out at Indian restaurants, which does not happen here in Central Maine as often as when I lived in New Zealand. I first tasted this dish at a street vendor in Pennsylvania that was in town as part of a festival. I went back to the vendor every day that the festival was on – I just couldn’t resist! 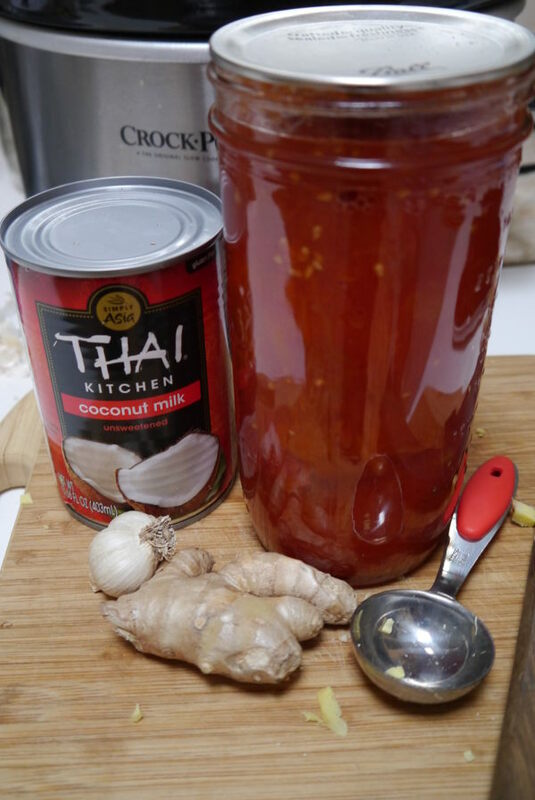 I can’t say that this tastes the same as the dish that you get when you eat out, but it is still good and may be a bit healthier.The ingredients for this sauce are all things I happened to have on hand. 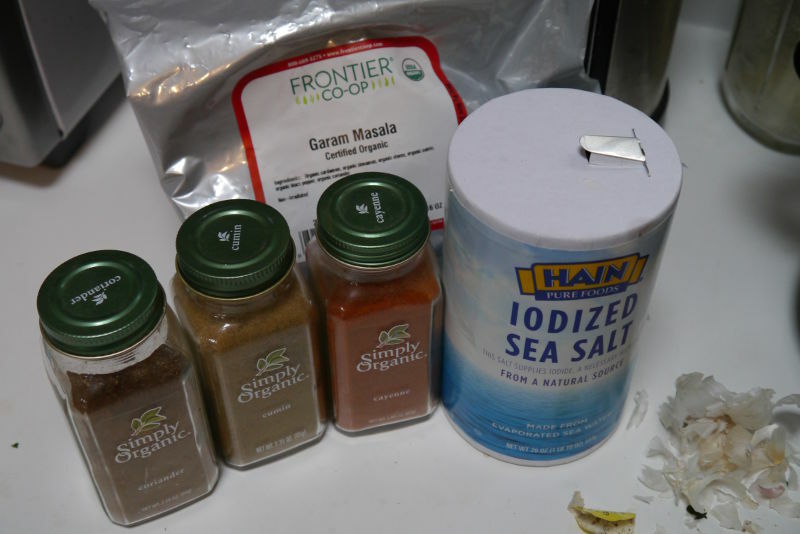 I just bought a 16 oz bag of organic Garam Masala, so time to open it up! I am still working my way through all the tomatoes that I put away last summer. The quantity of jars is getting low, so I use part of a pint and a half jar when a pint would have been perfect for this. It is just about time to start those seeds for the coming season, but I need to find a spot for the little delicate things that will be out of the Little Man’s reach. If you give it a go, please let me know how it turns out! Put the frozen spinach in the slow cooker. Plug the cooker in and set it to 8 hours on low. Add the spices and the coconut milk to the spinach in the cooker. In an hour or so, when the spinach is defrosted and cooked down a bit, give the spinach and spices a stir. Then prepare the lamb shanks. Put the lamb shanks in a bowl and mix with flour of your choice to cover. Heat a pan with a thin layer of oil, and brown the shanks in batches. Cook for approximately 2 min per side (I rested the shanks that I cooked on 3 sides each, so each shank took ~6 min to brown). Add the browned lamb shanks to the slow cooker. Cook until the meat is tender and falling off the bones. Add more salt to taste, cook up some rice to go with it and enjoy! This entry was posted in Cookery and tagged lamb shank, recipe, Saag, spinach, tomato by beettheratrace. Bookmark the permalink.